Three-mile fall – Fix Bayonets! Needless to say that startling command got my attention. As you will read in this report, this was just the beginning of my problems! 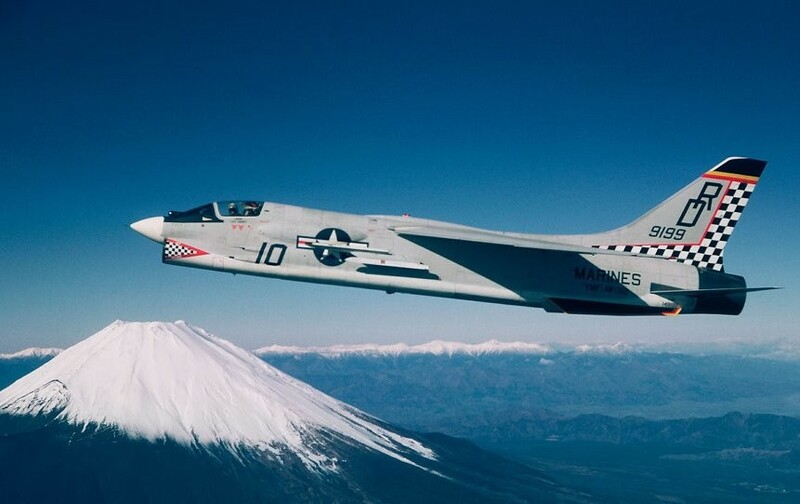 It had all started in the brilliant sunlight 20,000 feet above the Pacific Ocean as I nudged my F-8 Crusader jet into position behind the lumbering, deep-bellied refueling plane. After a moment of jockeying for position, I made the connection and matched my speed to that of the slowpoke tanker. I made the graceful task of plugging into the trailing fuel conduit so they could pump fuel into my tanks. This in-flight refueling process was necessary, and routine, because the F-8 could not hold enough fuel to fly from California to Hawaii. This routine mission was labeled Trans-Pac, meaning Flying Airplanes across the Pacific. This had been going on for years. Soon, after plugging-in to the tanker, my fuel gauges stirred, showing that all was well. In my cockpit, I was relaxed and confident. As I was looking around, I was struck for an instant by the eeriness of the scene: here I was, attached, like an unwanted child, by an umbilicus to a gargantuan mother who was fleeing across the sky at 200 knots as though from some unnamed danger. Far below us was a broken layer of clouds that filtered the sun glare bouncing off the Pacific. In my earphones, I heard Major Van Campen, our flight leader, chatting with Major D.K. Tooker who was on the deck of a Navy destroyer down below. The day before, Major Tooker had ejected from his aircraft, in this same area, when his Crusader mysteriously flamed out during refueling. At that time, no one knew why. We all supposed it had been some freak accident that sometimes happens with no explanation. One thing we knew for sure, it was not pilot error. This accident had to be some kind of mechanical malfunction, but what? Our squadron had a perfect safety record and we were very disturbed because of the loss of an F-8 Crusader the day before. “Eleven minutes to mandatory disconnect point,” the tanker commander said. I checked my fuel gauges again, everything appeared normal. My thoughts were, in a few hours we’d all be having dinner at the Kaneohe Officers Club on Oahu, Hawaii. Then after a short rest, we’d continue our 6,000-mile trek to Atsugi, Japan, via Midway and Wake Island. 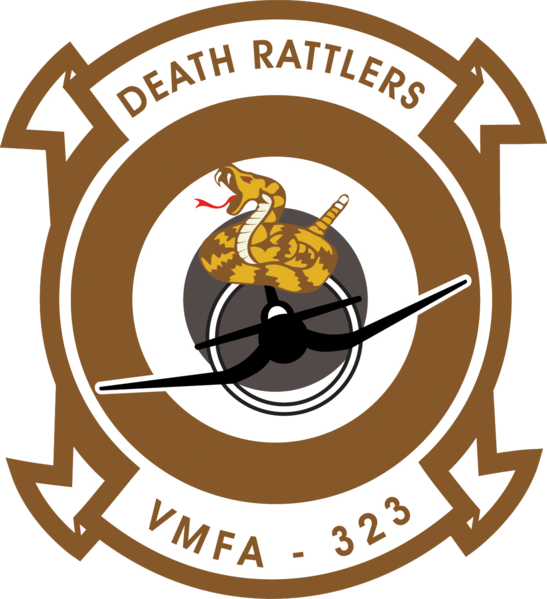 Marine All Weather Fighter Squadron (VMF)(AW) 323 was being transferred to the Far East for a one-year period of operations. My fuel gauges indicated that the tanks were almost full. I noticed that my throttle lever was sticking a little. That was unusual, because the friction lock was holding it in place and was loose enough. But now grew tighter as I tried to manipulate it gently. Unfortunately, my radio was already dead; I was neither sending nor receiving anything via my radio. I quickly disconnected from the tanker and nosed the Crusader over, into a shallow dive, to pick up some flying speed to help re-start the engine. That gave me a few seconds to think. I yanked the handle to extend the air-driven emergency generator, called the Ram Air Turbine (RAT), into the slipstream, hoping to get a spark of ignition for an air start. The spark igniters clicked gamely, and the RPM indicator started to climb slowly, as did the tailpipe temperature. This was a positive indication that a re-start was beginning. Fuel was pouring out of my aircraft from its tailpipe; its intake duct, from under the wings, and then the whole mess of fuel ignited behind the Crusader in an eye-popping trail of fire and smoke. The suddenness of the disaster nearly overwhelmed me. This can’t be happening to me! And various voices in my ears kept urging me to fire the ejection seat and abandon the aircraft. I took my hands off the flight controls and reached above my head for the canvas curtain that would start the ejection sequence. I pulled it down hard over my face and waited for the tremendous kick in the pants to send me rocketing upward, free of the aircraft. Nothing happened! The canopy, which was designed to jettison in the first part of the ejection sequence, did not move at all. It was still in place. My surprise lasted only a second. Then, I reached down between my knees for the alternate ejection-firing handle, and gave it a vigorous pull. Again, nothing happened. Both, the primary, and the secondary ejection procedures had failed. Now I was trapped in the cockpit of the burning aircraft. The plane was now in a steep 60-degree dive. For the first time, I felt panic softening the edges of my determination. I knew that I had to do something or I was going to die in this bad airplane. There was no way out of it. With great effort, I pulled my thoughts together and tried to focus on some solution. But that’s probable suicide. That lousy suggestion must have come from the tanker skipper or one of the destroyer commanders down below because every jet pilot knows you can’t ditch a jet aircraft and survive. The plane would hit the water at a very high a speed, flip over and sink like a stone. More typically it would explode on impact with an ocean swell. I grabbed the control stick and leveled the aircraft. Then, I yanked the alternate ejection handle again in an attempt to fire the canopy to begin the ejection sequence. Nothing happened. That left me with only one imaginable way out, which was to jettison the canopy manually and try to jump from the aircraft without using the ejection seat. But was such a thing even survivable in a sophisticated fast-moving jet fighter? I was not aware of any Crusader pilot who had ever used this World War II tactic to get out of a fast flying jet. I had been told that this procedure, of bailing out of a jet, was almost impossible. Yes, the pilot may get out of the airplane … but the massive 20-foot high tail section is almost certain to strike the pilot’s body and kill him before he falls free. My desperation was growing, and any scheme that offered a shred of success seemed better than riding that aircraft into the sea, which would surely be fatal. With my hands, I disconnected the canopy and with a great whoosh it disappeared from over my head never to be seen again. Before trying to get out of my confined quarters, I trimmed the aircraft to fly in a kind of sidelong skid: nose high and with the tail swung around slightly to the right. Then I stood up in my seat and crossed both arms in front of my face. I was sucked out harshly from the airplane. I cringed as I tumbled outside the bird, expecting the tail to cut me in half, but thank goodness that never happened! In an instant, I knew I was out of there and uninjured. I waited —and waited— until my body, hurtling through space, with the 225 knots of momentum started to decelerate. I manually pulled the D-ring on my parachute and braced myself for the shock. I heard a loud pop above me, and I looked up to see the small pilot chute had deployed (to keep the pilot from flailing around until the main chute opens). But, I also noticed a sight that made me shiver with disbelief and horror because the 24-foot main parachute was just flapping around in the breeze . . . tangled among its own shroud lines. I could see the white folds neatly arranged, feebly fluttering around in the free-fall’s relative wind. I shook the risers in an attempt to possibly balloon chute open the fouled parachute. It didn’t work. With my hands and arms, I pulled the bundle down toward me then wrestled with the unsymmetrically twisted shrouds. It was an unforgiving mess … but I worked on it while trying not to think about free falling toward the ocean. I looked down hurriedly. There was still plenty of altitude remaining. I quickly developed a frustrating and sickening feeling. I wanted everything to halt while I collected my thoughts, but my fall appeared to accelerate. I noticed a ring of turbulence in the ocean. It looked like a big stone had been thrown in the water. It had white froth at its center; I finally realized this is where my airplane had crashed into the Pacific. Would I be next to smack into the water now … coming up … Fast? Again, I shook the parachute risers and shroud lines, but the relative wind was holding my chute embraced in a bundle. I had done all I could reasonably do to open the chute and it was not going to open. I was just along for a brutal ride that may kill or severely injure me. I descended rapidly through the low clouds. Now there was only clear sky between the ocean and me. This may be my last view of the living. I have no recollection of positioning myself properly or even bracing for the impact. In fact, I don’t remember hitting the water at all. At one instant I was falling very fast toward the ocean, then, the next thing I remember is hearing a shrill, high-pitched whistle that hurt my ears. The water helped clear my senses. But as I struggled around in the water I began coughing and retching. The Mae West around my waist had inflated. I concluded that the shrill whistling sound that I had heard was the gas leaving the CO2 cylinders and filling the life vest. A sense of urgency gripped me, as though there were some task I ought to be performing. Then it dawned on me what it was. The parachute was tugging at me from under the water. Finally, it had billowed out (much too late) like some Portuguese man-of-war. I tried reaching down for my hunting knife located in the knee pocket of my flight suit. I had to cut the shroud lines of the chute before it might have pulled head under water for good. This is when I first discovered that I was injured severely. The pain was excruciating. Was my back broken? I tried to arch it slightly and felt the pain again. I tried moving my feet, but that too was impossible. My feet were immobile and I could feel my feet’s bones … grating against each other. There was no chance of getting that hunting knife. But I had another, smaller one in the upper torso of my flight suit. With difficulty, I extracted it and began slashing feebly at the spaghetti-like shroud line mess surrounding me. Once free of the parachute, I began a tentative search for the survival pack. It contained a one-man life raft, some canned water, food, fishing gear, and dye markers. The dye markers colored the water around the pilot to aid the rescue team in finding a down airman. All of this survival equipment should have been strapped to my hips. It was not there. On contact with the water, the equipment had been mightily physically ripped off my body. “How long will this Mae West preserver hold me up? ” I wondered. In any case, I knew I needed a hand: fast. The salt water that I had swallowed felt like an enormous rock in the pit of my gut. But worst of all, I was completely on my own, 600 miles from shore, lolling in the deep troughs and crests of the Pacific Ocean, and my Crusader aircraft, upon which I’d lavished such affectionate attention, was sinking thousands of feet to the bottom of the ocean. At that moment, I was struck by the incredible series of coincidences that had just befallen me. I knew that my misfortune and survival had been a one-in-a-million occurrence. In review, I noted that the explosion aloft should not have happened. The ejection mechanism should have worked. The parachute should have opened. None of these incidents should have happened. I had just experienced three major catastrophes in one flight. My squadron had a perfect safety record. Why was all of this happening? In about ten minutes I heard the drone of a propeller-driven plane. The pot-bellied, four-engine tanker came into view, flying very low. They dropped several green dye markers near me, and some smoke flares a short distance from my position. They circled over-head and dropped an inflated life raft about 50 yards from me. I was so pleased and tried to swim toward the raft. When I took two strokes, I all most blacked out due to the intense pain in my body. The tanker circled again and dropped another raft closer to me, but there was no way for me to get to it, or in it, in my condition. The water seemed to be getting colder, and a chill gripped me. In about an hour, a Coast Guard amphibian plane flew over and circled me as though deciding whether or not to land. But the seas were high and I knew he couldn’t make it. He came in very low and dropped another raft; this one had a 200-foot lanyard attached to it. The end of the lanyard landed barely ten feet from me. I paddled gently backward using only my arms. I caught hold of it and pulled the raft to me. Even before trying, I knew I couldn’t crawl into the raft due to my physical condition. I was able to get a good grip on its side and hold on, and this gave me a little security. The Coast Guard amphibian gained altitude and flew off. (I learned later that he headed for a squadron of mine- sweepers that was returning to the United States from a tour of the Western Pacific. He was unable to tune to their radio frequency for communications, but this ingenious pilot lowered a wire from his aircraft and dragged it across the bow of the minesweeper, the USS Embattle. The minesweeper captain understood the plea, and veered off at top speed in my direction). I was fully conscious during the two and a half hours it took the ship to reach me. I spotted the minesweeper while teetering at the crest of a wave. Soon, its great bow was pushing in toward me and I could see sailors in orange life jackets crowding its lifelines. A bearded man in a black rubber suit jumped into the water and swam to me. “Are you hurt?” he asked. I was now very cold and worried about the growing numbness in my legs. Perhaps the imminence of rescue made me light-headed, for I only vaguely remember being hoisted aboard the ship. I was laid out on the ship’s deck as they cut away my flight suit. “Don’t touch my legs! DON’T TOUCH MY LEGS!” I screamed. I don’t remember it. Somebody gave me a shot of morphine and this erased part of my extreme pain. An hour or so later a man was bending over me and asking questions. It was a doctor who had been high-lined over from the USS Los Angeles, a cruiser that had been operating in the area). Somehow they got me into a wire stretcher, and hauled me, dangling and dipping, across the watery interval between the Embattle and the cruiser. In the Los Angeles’s sickbay, they gave me another shot of morphine, thank God, and started thrusting all sorts of hoses into my body. I could tell from all the activity, and from the intense, hushed voices, that they were very worried about my condition. My body temperature was down to 94 degrees; my intestines and kidneys were in shock. The doctors never left my side during the night. They took my blood pressure every 15 minutes. I was unable to sleep. Finally, I threw-up about a quart or more of seawater. After this my nausea was relieved a bit. By listening to the medical team, who was working on me, I was able to piece together the nature of my injuries. This is what I heard them saying. My left ankle was broken in five places. My right ankle was broken in three places. A tendon in my left foot was cut. My right pelvis was fractured. My number 7 vertebra was fractured. My left lung had partially collapsed. There were many cuts and bruises all over my face and body, and, my intestines and kidneys had been shaken into complete inactivity. The next morning Dr. Valentine Rhodes told me that the Los Angeles was steaming at flank speed to a rendezvous with a helicopter 100 miles from Long Beach, California. At 3:30 that afternoon, I was hoisted into the belly of a Marine helicopter from the USS Los Angeles’s fantail, and we whirred off to a hospital ship, the USS Haven, docked in Long Beach, CA. Once aboard the Haven, doctors came at me from all sides with more needles, tubes, and X-ray machines. Their reaction to my condition was so much more optimistic than I had expected. I finally broke down and let go a few tears of relief, exhaustion, and thanks to all hands, and to God. Within a few months I was “all systems go” again. My ankles were put back in place with the help of steel pins. The partially collapsed left lung re-inflated and my kidneys and intestines were working again without the need for prodding. The Marine Corps discovered that the cause of my flameout [and that of Major Tooker, the previous day] was the failure of an automatic cut-off switch in the refueling system. The aircraft’s main fuel tank was made of heavy reinforced rubber. When the cut-off switch failed, this allowed the tank to overfill and it burst like a balloon. This then caused the fire and flameout. Do I feel lucky? That word doesn’t even begin to describe my feelings. To survive a 15,000-foot fall with an unopened chute is a fair enough feat. My mind keeps running back to something Dr. Rhodes told me in the sickbay of the Los Angeles during those grim and desperate hours. He said that if I had had a spleen, it almost certainly would have ruptured when I hit the water, and I would have bled to death. Of the 25 pilots in our fighter squadron, I am the only one without a spleen. It gives me something to think about. Maybe it does you as well. Mustang’s note: I originally encountered this story in a Reader’s Digest about 30 years ago. I shuttered to think of falling three miles into the Pacific Ocean. I thought then, and I think now … Cliff Judkins’ survival is nothing short of a miracle. Now one might argue that his survival was just pure luck. But for me, Judkins didn’t simply survive a mind-boggling fall —he survived other calamities, each of which should have killed him. Do I believe in God? I most assuredly do.